in the #8 Monte Carlo owned by DEI. This was Dale Jr's first year in the Busch Series. He raced a limited season. September 21st - Budweiser and DEI Racing announce a sponsorship for a limited race (5) schedule for Winston Cup in 1999 and full time in 2000. 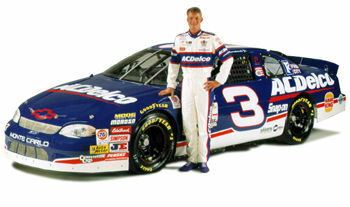 Dale Jr will debut in five Winston Cup Race this year in preparation for his full WC schedule in 2000. July 11, 1999 Dale Jr.'s second Winston Cup appearance. Started 13th, retired on lap 42 due to broken transmission finishing 43rd. Aug 22, 1999 Dale Jr's third Winston Cup appearance. Started 17th finished 24th.